Recently Donna and Kenny decided to take advantage of Mummu's full size washing machine to make short work of the bedding. Our little Panda washing machine, while it has endeared itself to me, still is rather limited with what it can handle in a single load. I would say that it can only do one sheet at a time, and it best not be a very heavy one at that. As soon as they left, I took a rather unsatisfactory break to gather my thoughts. With the break over I decided I best have something to show for my time alone. Just before the two of them had left, I had cleared under the bathroom sink to prepare to hook it up to the water line in place since the fall (when it had leaked many, many litres of water onto my floor, unnoticed during the night). 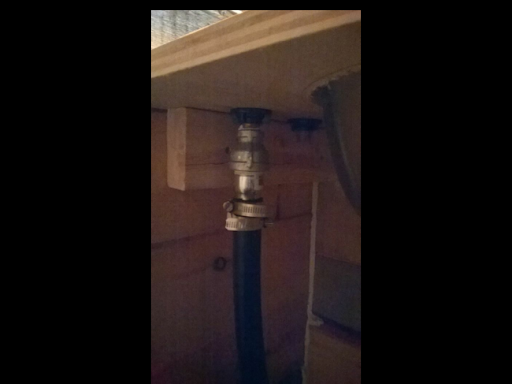 In the sauna, I turned the shut off valves on each tank, and then opened up the kitchen sink faucet. 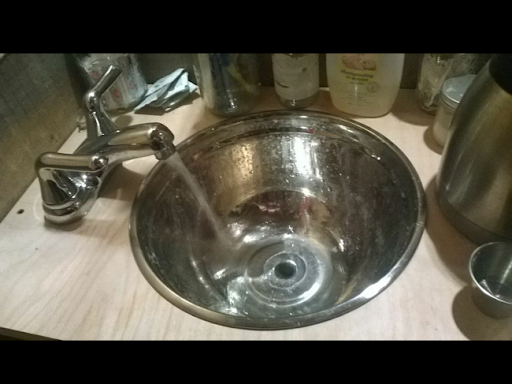 Even so, I had to drain a little water into a basin as the bathroom sink is a few inches lower than the kitchen one. Luckily, I had extra fittings from my failed attempts to have hot running water at multiple sinks. In fact, the length of hose was pretty much exactly correct - serendipidous, as I was thinking I would have to cut it, and fearing it would be too short. With a little manipulation, it slid onto the adapter under the taps, and this time I (correctly) double clamped it. I returned to the sauna, turned on the valves, pondered pessimistically "what if it leaks and it takes me a few minutes to get to the cabin, and then a few more minutes to get back here to shut off the valves?" For once, I needn't have worried. I returned to dry pipes, which gurgled and belched briefly when I turned on the bathroom faucet. Suddenly - water! I could wash my hands! I could rinse out the toothpaste in the sink! 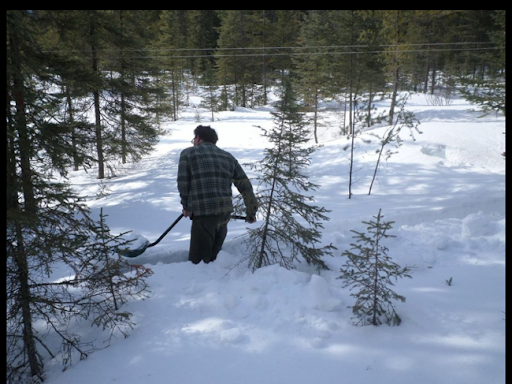 Once I fish some of the twigs and leaves out of the well that fell in while Grandpa and I were thawing the short section of line there, I will be prepared to use this water to also wet my toothbrush and rinse my mouth while brushing teeth. I don't see it to be much more hazardous than swimming in the lake at camp and getting some lake water in my eyes, up my nose, or in my mouth. I *know* that animals are doing thier business (including a rather grisly death that Grandpa described last fall) directly in *that* water. At least my well is filtered through a few feet of sand, and clay before that. I plan on shocking the well with some chlorine once I get those physical objects out as well. But then I think I will return to using the Berkefeld filter and will even contemplate drinking the filtered water, even if it comes back with bacteria reports. 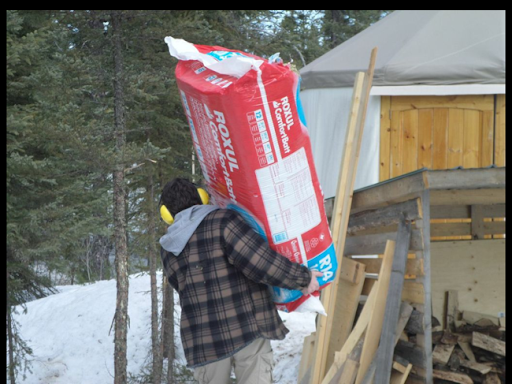 I'm very tired of hauling water from the neighbours, no matter how nice the visit. 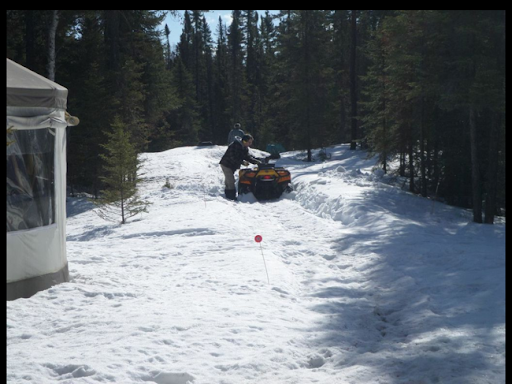 With the melting of the snow everywhere, the packed trail between Mummu and Grandpa's house and our cabin had become extremely treacherous. 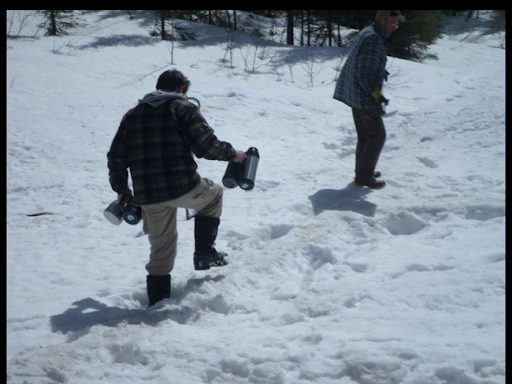 In fact, my foot is STILL store from going down hard while carrying both water jugs. Luckily Papa saw me coming and rushed out to help, with similar results. Grandpa came to visit shortly afterwards and agreed that the pathway was no longer suitable for moving water back and forth. Although the well was opened up, our water is not yet fit to drink. I have ordered more filters for our Berkefeld filter, but in the meantime we are still relying on Mummu and Grandpa's for our drinking water. 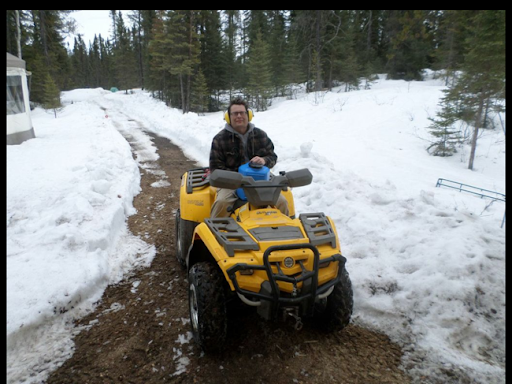 With that trail closed, I attempted to get down our laneway with the ATV, but rapidly became stuck. 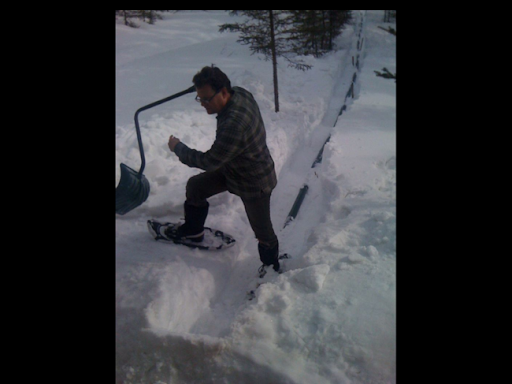 Grandpa fetched his gravel shovel and managed to make a good showing in front of the cabin before he broke for lunch. 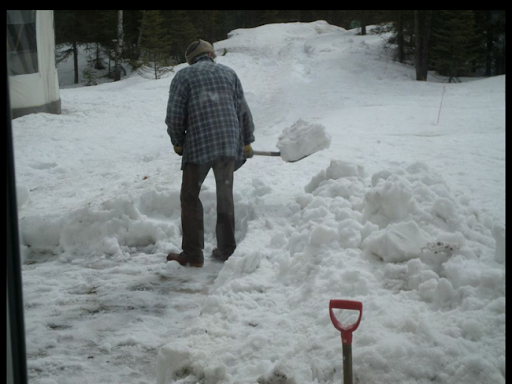 When he returned, I grabbed my similar shovel and began where the ATV had left off. My path was a fair bit narrower, as I am lazy (or efficient?) 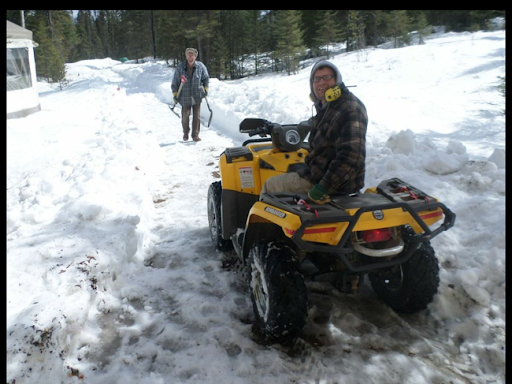 and only shoveled exactly to the width of the ATV. Once we reached one another, I climbed into the seat of the ATV and established that it was possible to get to the front door! So, I loaded up the water jugs and drove to Mummu's via the front driveway. This worked well! 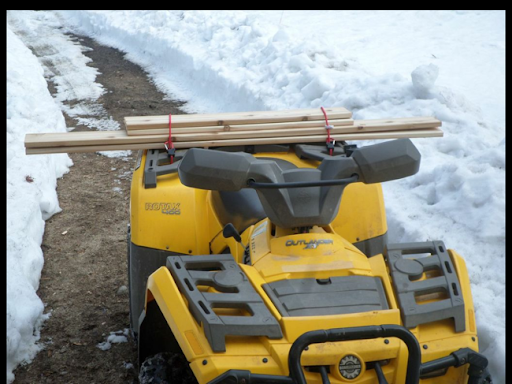 Subsequently, I have also used the ATV to help me move some insulation and lumber from the dojo tent to the yurts/cabin area. 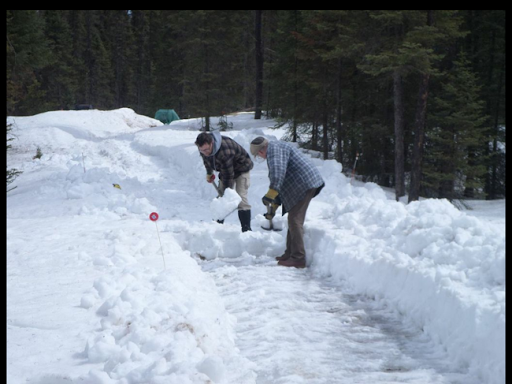 Next year, I really hope to be able to keep our laneway open right from the road to the cabin. The ATV plough should go a long way towards accomplishing this hope! 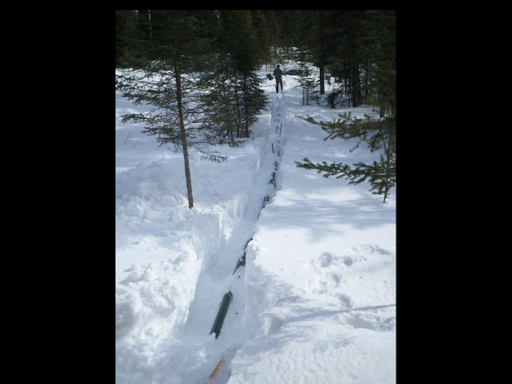 The advent of some wonderfully sunny and warm weather got me once again excited about the prospect of having our water lines back in action. 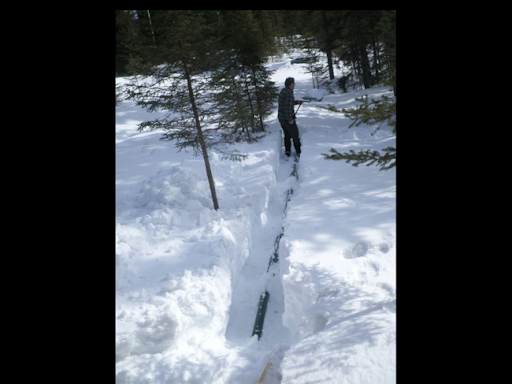 I strapped on the snowshoes, and began digging down to the exposed water line at the sauna. I had painted it a dark green last summer (to protect the pipe from UV, as well as to help disguise it in the underbrush). 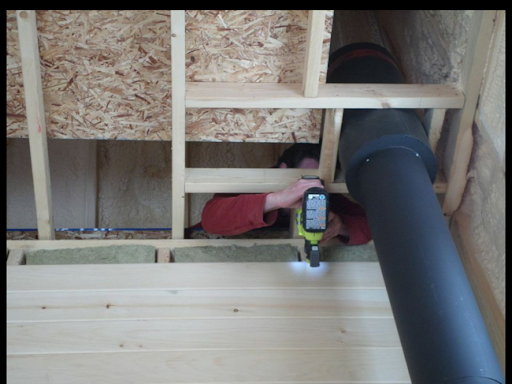 With the amount of sun we were getting, I felt that exposing the pipe would help it to heat up to a far more beneficial degree than the snow was insulating it. For the next few days after exposing it to a few hours of sunlight, I also turned on the heating cable down in the well and between the sauna and the cabin. This appeared to not be helping with whatever blockage existed, as turning on the well pump still didn't result in any water appearing in the sauna. 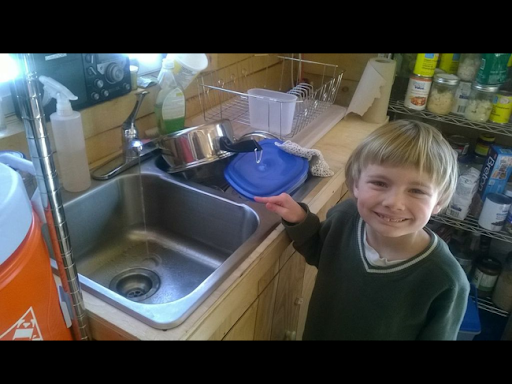 After Nana and Papa had returned home, Grandpa showed up to help me out with getting the water flowing again. 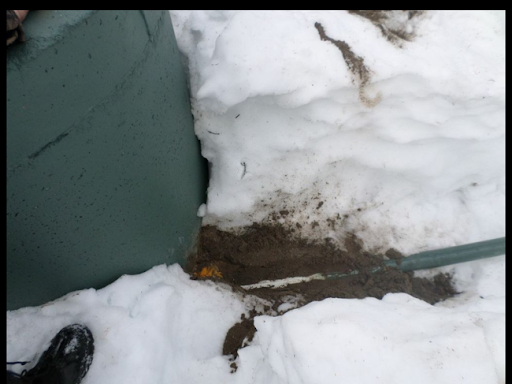 We opened up the well cover and were immediately struck by the amount of water sitting on top of the ice down there, as well as the obvious melting of the ice around my pipe. Clearly the short heat line I had put down the well had been doing its job. In fact, I would say that it exceeded my expectations! 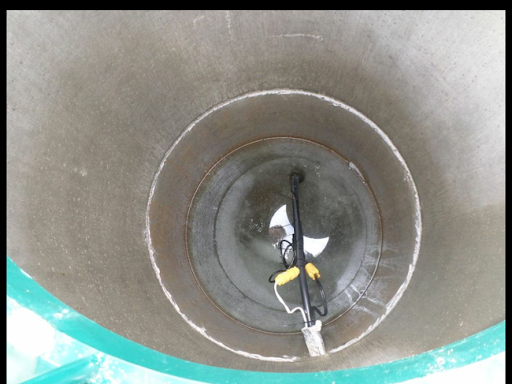 Turning the pump on and off showed that the surface of the well water wasn't fluctuating much, indicating that perhaps the blockage was still close to the pump itself. Assuming that the heat cable had kept liquid water in the first few feet of pipe, we got Donna to provide us with a number of containers of hot water which we poured on the pipe on both sides of the well casing (again, the place where the coldest temperatures and the least slope coincided). I don't know if you can imagine my surprise when Donna turned on the pump again, and in a few moments reported that water was flowing into the sauna! I have to confess to a fair amount of jealousy. After a week or two of sitting in the sauna waiting for water to flow, I was put out that I wasn't the first one to get to report the good news. Water in the sauna was so exciting! 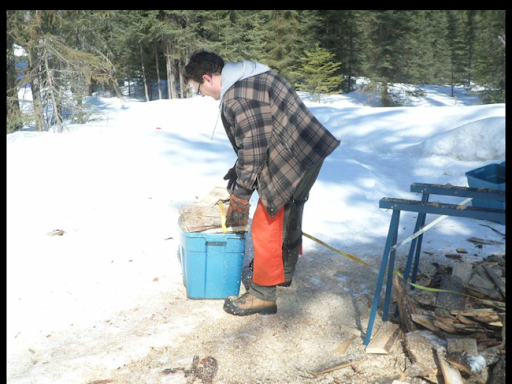 I was more than happy to schlep buckets from there to the cabin. 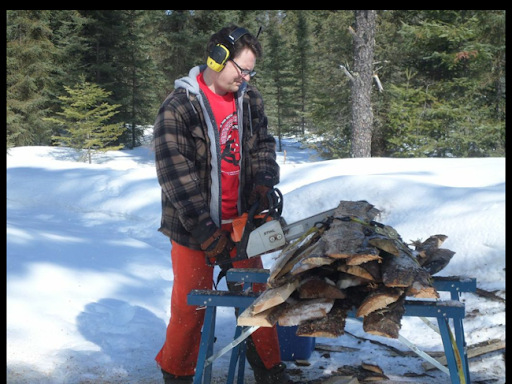 I returned to the cabin feeling satisfied with a days labour, but decided to push my luck, turning on the heat cable between the cabin and the sauna, and turning on the tap at the sink. (Yes, I was also smart enough to remove the plug from the sink drain). After about ten minutes sitting at the iPad, I realized I heard trickling water behind me! There was a small stream of water flowing! I called Kenny over to take a photo, and immediately texted Donna (who was warming the sauna) and instant messaged everyone who was online at that moment. A quick post (that most of you have already seen) was warranted, it was such an exciting moment! The water has continued to flow unimpeded here in the cabin, although very soon I will shut it off temporarily to install the bathroom faucet properly. Heady and exciting times! Just like last winter, I burned through my entire supply of firewood while there was still snow on the ground, and was forced to scrounge. Luckily Papa was here and raring to go - in the morning after his trip to the Tardis, it appeared that he dug out a bunch of slabs from down by the sawmill. 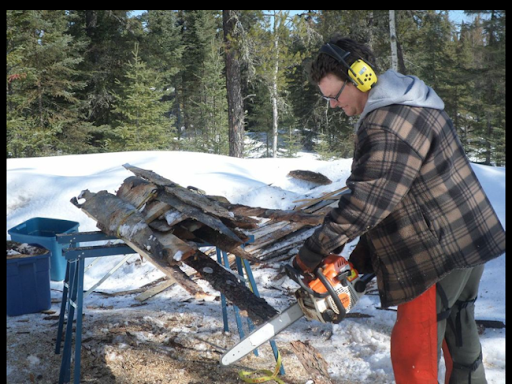 Working together, we managed to pull out a few more slabs and then I set up the sawhorses and prepared the chainsaw. Papa continued pulling out all the slabs he could move, and when he couldn't budge any more, I fired up the saw and he began loading bins with the cut lengths. 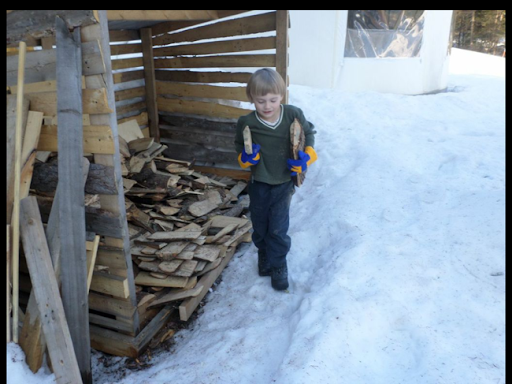 It sure was nice to see the pile of slabs in our woodshed though. I was pretty sure that there was enough there to see us through until the snow was gone and I could retrieve more windfalls from the 100 acre wood. Of course, things are a bit cooler now, and I see fifteen below predicted for this coming week, so maybe I'll have to repeat the process by myself if winter hangs on much longer. Donna, Kenny and Nana went to town together, leaving Papa and myself behind to try to accomplish as much as possible in the short time they were away. After fellowshipping briefly and planning our respective tasks, methods and order of construction, we got down to business. These upper walls were within an inch of exactly eight foot lengths. 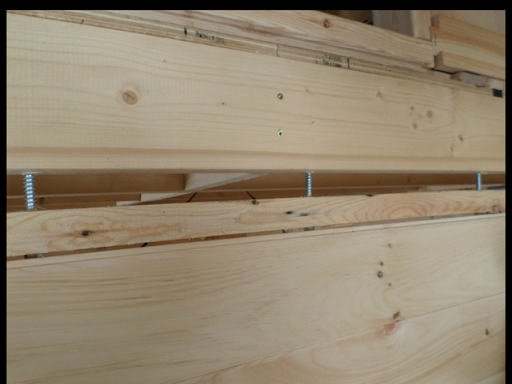 This is something I was very pleased to discover, as in the other portions of the bedroom I was disappointed with how large of gaps had opened up in the v-joint over the course of the past winter. With no joints, hopefully at least on the horizontal I wouldn't see too many gaps. Papa used my cordless circular saw to cut lengths, and then passed them to me on the loft. 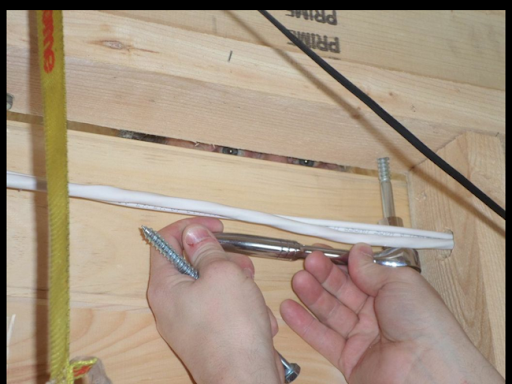 I reached through the stud wall to fire my nailer back into the boards. This was easier than I feared, but still a challenge at times. When I reached the top of the wall, I switched to the inside of the room and panelled it too. 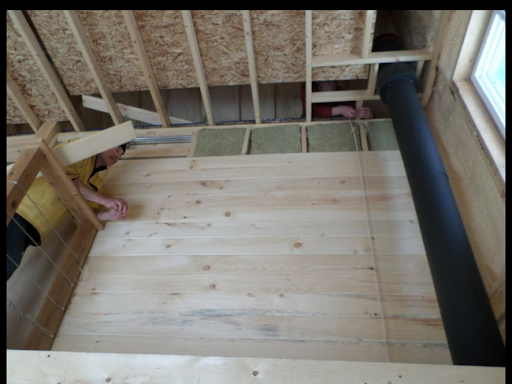 We installed some Roxul (mineral wool) insulation into this wall to help reduce sound. 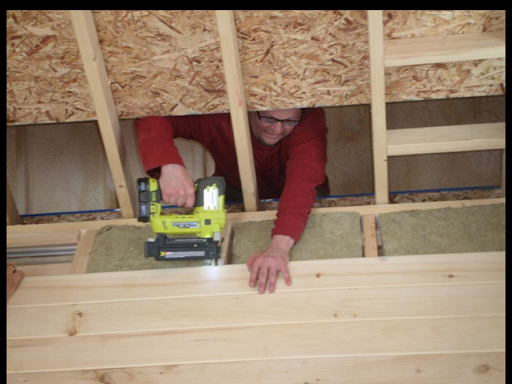 I plan on installing insulation into every wall, as well as the floor/ceiling of the loft mainly for this reason, although in the pantry, the insulation will hopefully allow us to keep the pantry at a cooler temperature than much of the rest of the cabin. In fact, I would be quite happy to only heat the main open area of the cabin, and allow the other rooms to be significantly cooler, heated only by leaving their door open when required. At the top of the wall, Papa ripped a board to size and we nailed it in place. Papa was more surprised than I was that the difference in height was nearly an inch from one end to the other. 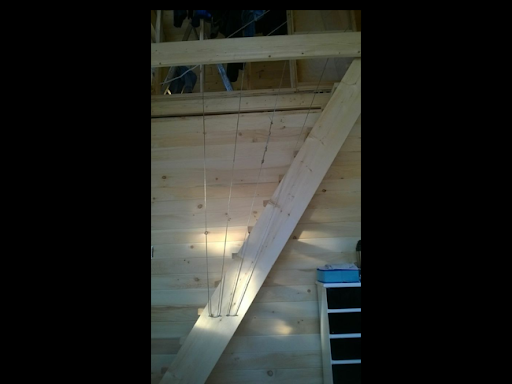 To finish the outside of the loft wall, I headed up into our attic space and reached down through the collar ties to get a decent angle for nailing. This was also a challenge, but it worked out fine in the end. 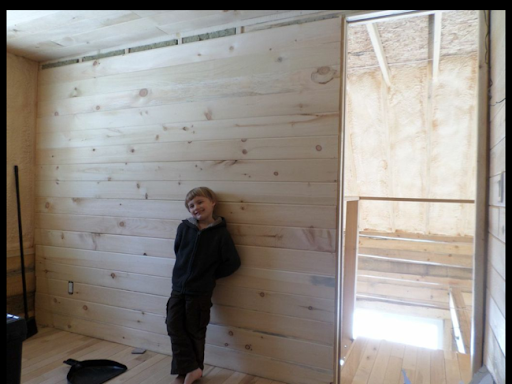 We were encouraged to finish the final boards by the arrival of Kenny and the ladies, and it has made a huge difference in the look and feel of the bedrooms and cabin in general. 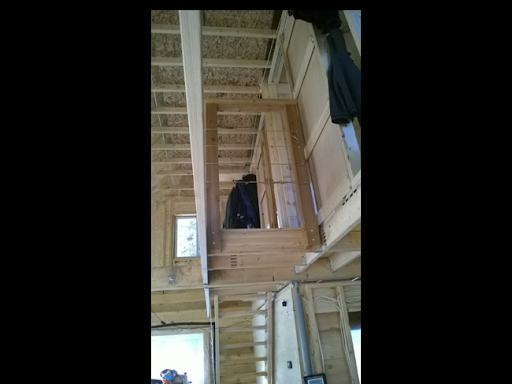 The cabin doesn't feel smaller for the newly enclosed loft, and in fact, it seems that things are brighter on both sides of the wall. 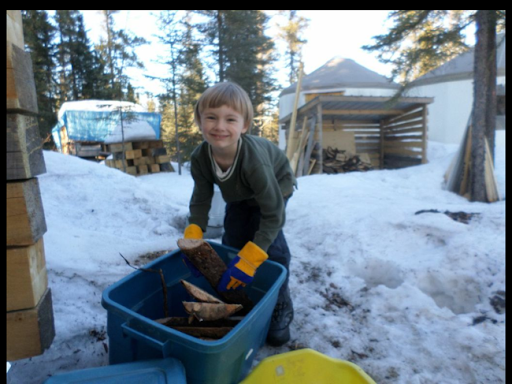 With the arrival of Nana and Papa, I had a new vigour to accomplish different tasks aroud the homestead. 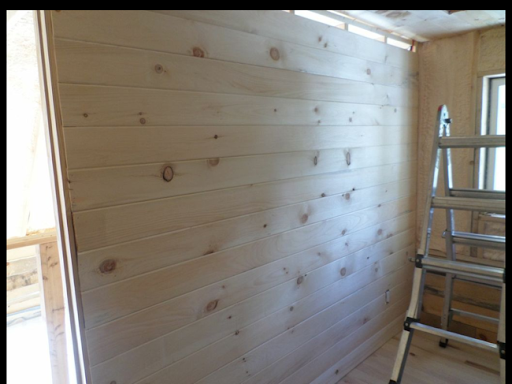 This time coincided with me obtaining a bunch of new v-joint panelling, so Papa and I decided to try to finish at least one side of every wall remaining in the cabin, to finish defining the rooms. To cut our teeth though, I suggested that we could straighten out the main floor bedroom wall. 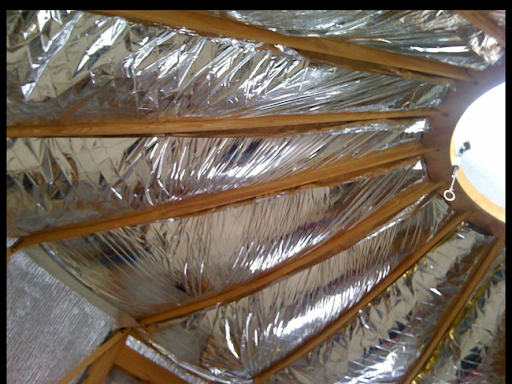 This one had been built out of my own rough-cut two by fours, and while they had had some time to air dry, either the top plate curved after installation, or it went unnoticed when I built up the wall initially. 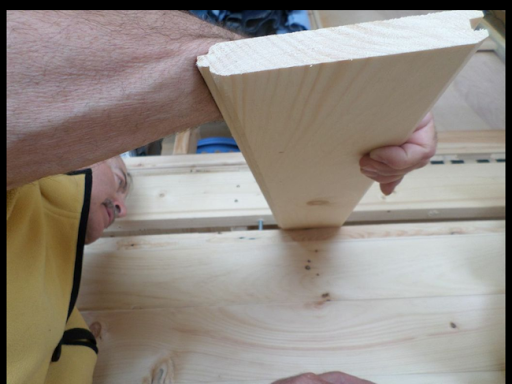 My plan, as approved by Papa, was to lever the wall straight, then drill out about 3/8" holes in the top, and install lag bolts through these holes into the edge of the floor joist above. 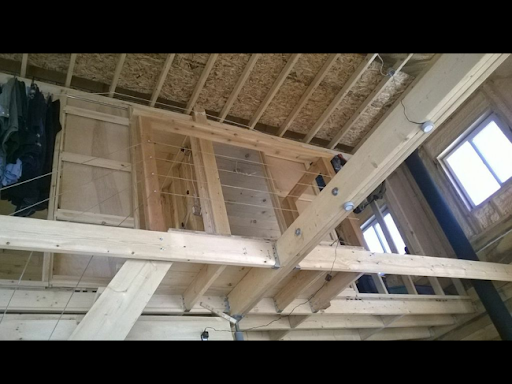 As the loft settled, the bolts would be free to slide through my holes but the vertical shaft of the bolt would still hold the wall directly under the rafter. 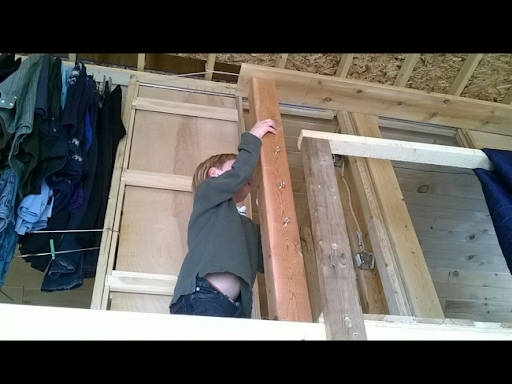 First we levered the wall into position. And hey voila! A straight wall. 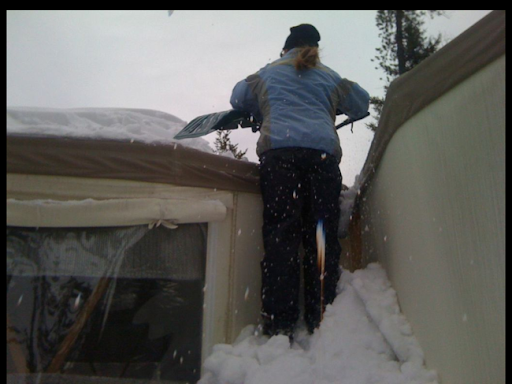 Just before spring finally started to melt our snow, we had two really powerful dumps which put a strain on all our original rooflines. 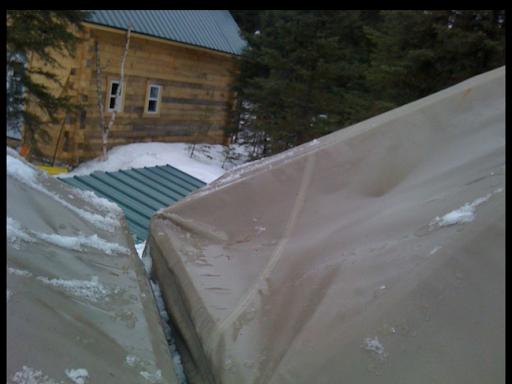 The sauna I had already shovelled off once, and the dojo tent I had been half-heartedly poking from beneath all winter (the combination of snow and fabric was really quite heavy!) 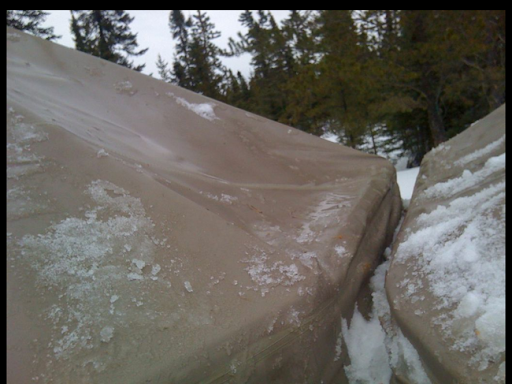 until I made one last concerted push from both inside and outside to clear it nearly completely of snow. 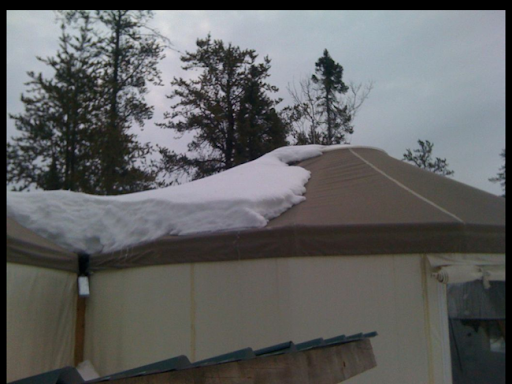 The yurts I had also pulled a bit of snow off of from time to time, but the junction between the two buildings was an area not easily accessible from the sides. From the outside, Donna had noticed that the fabric was pulling in an odd way, and upon interior inspection, the weight was bowing the rafters noticably. 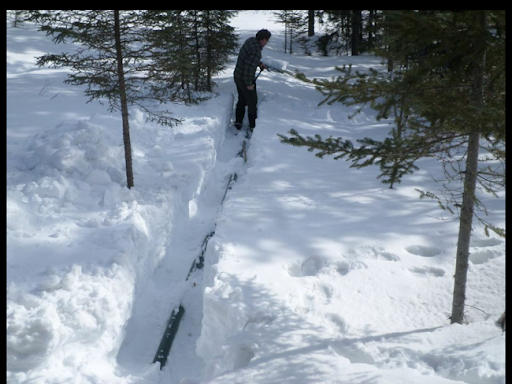 Fortunately, at this point the snow which had piled up on either side of the link was high enough for Donna and Kenny to stand on! 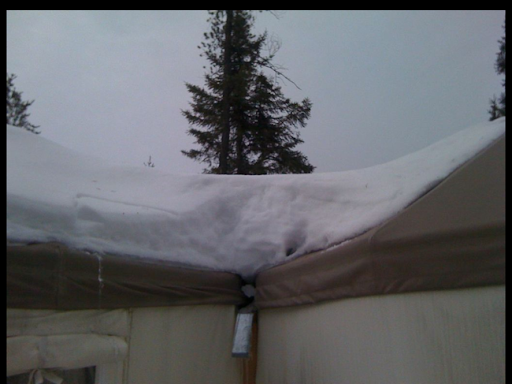 So, one day while I was away at my part-time job, I came home to find the yurts all cleared off, including this linkage! 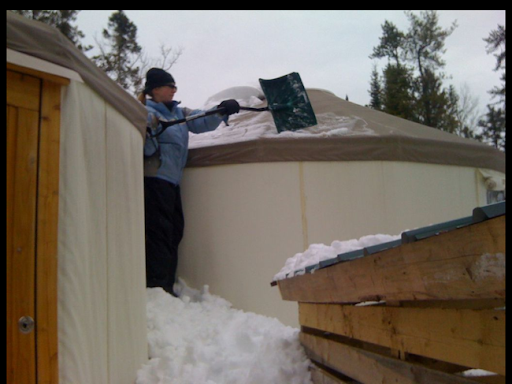 Donna and Kenny had spent the better part of their day shovelling off the yurts, as well as cleaning up the driveway to ensure that I could get back! Helping one another out unexpectedly is an awesome feature of our small family - one that I'm sure goes a long way to promoting the huge love and respect we all hold for one another. Civilization Returns To The Homestead - Gravity Fed Water Runs! I'll write up a longer post later, but for now... Yes! That's a trickle of running water INDOORS! With the stairs in their final position and my parents less than a week from arrival, I knew it was time to try to address some of the kludges I had been living with that would be cause for concern. One thing that was admittedly not up to anyone's standards was the railing I had built for the landing. It would likely have withstood one person falling against it hard, once, but that wasn't going to cut the mustard any longer. It was not enclosed beneath the rail, although Donna did keep blankets hung from it at all times to act as an extra visual cue that the area was a hazard. The rail itself was uncomfortably low. On the order of slightly less than three feet. This is a fine height for a counter, but with an adult's centre of gravity above that, it felt more like a pivot point than a safety rail. 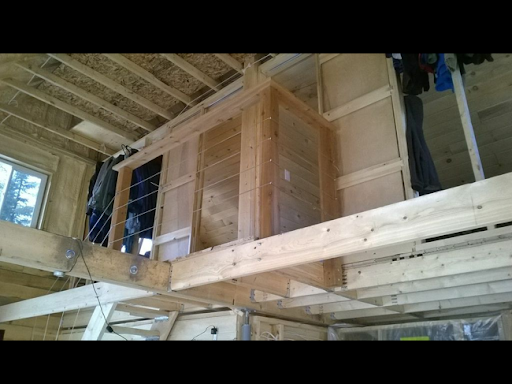 Leaving the rail in place, I opted to use four carriage bolts on some four inch by four inch by four foot cedar posts to beef things up. With these posts leveled and installed, I then capped them with a cedar deck board to act as the official "railing". This process was a delight to smell. Fresh cut cedar just has something about it. The railing worked great. It is actually notably higher than one would at first expect, but that seems to make it more comfortable to rest one's elbows on it were one to engage in a lengthy survey of the domain below :). Donna rightly pointed out that the rail sagged a fair bit when I rested my arms on the centre of the five foot span. I plan on purchasing another deck board and mounting it directly under the railing at a right angle to support it more strongly. This gave the landing a railing, but still didn't address the issue of the area between the posts and under the rail, where someone (or something) could easily slide under and off the landing. Especially at the new height. Enter our excess clothes line! 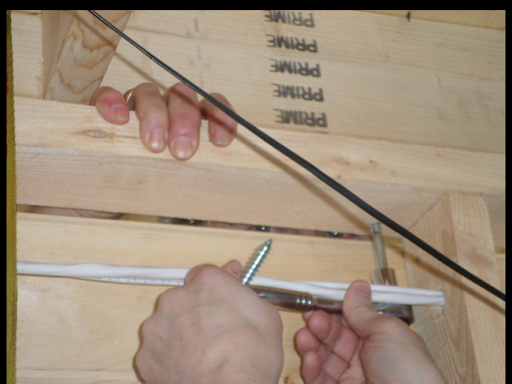 With a handful of eye hooks and a turnbuckle, I pressed Kenny into service mounting the hooks up and down the three posts. Donna suggested starting up high enough that someone could still SIT on the landing, and dangle their feet off, if they wanted to. We'll see how often this happens, but in the meantime, the option exists. Four lines, spaced at 6" intervals, worked out just about right. On the stair side of things, I fanned out the lines and then ran them down to a safe height at the main floor. This allowed the cables to act as a safety support for people on the stairs. I will see how this works in the long term, and decide if a railing is possible and/or required. As much as I tried to tighten these lines, two of them are still a bit loose, so I will add in more turnbuckles on each line to be able to tighten it individually. Otherwise, I feel it LOOKS and feels good, maybe even great.